For any geek, Wednesday is often the best day of the week; when new comic books arrive on the shelves at our friendly neighborhood comic book stores. 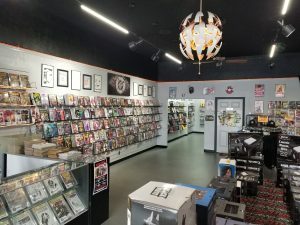 For Modesto, one of those stores happens to be Invincible Comics, a relative newcomer to the geek scene in our fair city. I managed to get a moment with owner Sean Beck to talk about the secret origins of Invincible Comics and what we can expect in the near future from them. 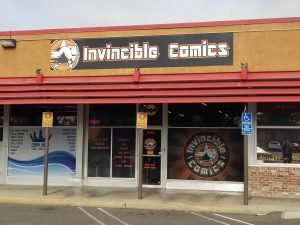 ModestoView: What inspired you to open Invincible Comics here in Modesto? 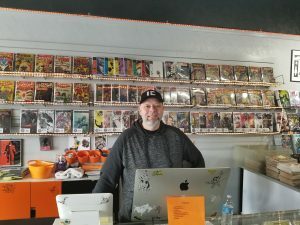 Sean Beck: Well I’m a nerd, and I love geek culture, I love comic book culture, and I just wanted a place where people could come in and talk “geek”; where people could have this community [built on] enjoying comic book culture. From the art to the writing, the inkers, the pencilers, everything about comic books. There’s a lot of television shows and films that people don’t even realize are based on comics, and there’s so many more planned for the future. I just saw it as an opportunity to be able to enjoy our Modesto geek community and help it expand and explode. MV: Where did the name “Invincible Comics” come from? Beck: I don’t want to get in trouble with (comic book writer) Robert Kirkman, but “Invincible” is my absolute favorite comic book and comic book character. It’s also based on my faith: Philippians 4:13 – “I can do all things through Christ Jesus who strengthens me.”, and to me that really personifies “Invincible”. We liked the name “Invincible Comics” and just went with it. 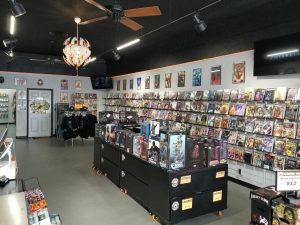 MV: As we’ve seen in the past, we had Bonanza Books and Comics, who were around for decades. It was a touchstone of the geek community here in Modesto. I know you personally had a friendship with the owners there, too. Do you feel that Invincible Comics continues the legacy of Bonanza Books and Comics? Beck: I’d like to think that, yeah. The Allen family are very special to me. I mean, I grew up going to Bonanza [when it was at] Roseburg Square. My first comic book was from a spinner rack at a gas station in Manteca, and then I begged my mom to take me to the closest comic book shop there was, which was Bonanza. I spent a lot of time over there, and when they moved to their McHenry Avenue location, that’s where I shopped for decades. They’re great people, I’ve become good friends with their youngest son Terry, and he’s taught me a lot about comics and comic book culture. I’d like to think that maybe the torch has been passed on, and we’d like to carry on what they’ve been doing for so long. To be in business for 44 years, they were doing something incredible. I hope we can be in business for that long, if not longer. MV: Speaking of the future, what’s next for Invincible Comics? Beck: We’ve got some plans for the future. We’d like to build a website, we’d like to build an online store, and hopefully, we can grow to the point where we can have store-exclusive covers for comics. For example, Detective Comics #1000 is coming out this year. I don’t think we’ll be ready for it, but there’s an opportunity where we could purchase our own store exclusive- where we get to pick the artist and so on and so forth. So that’s kind of where we want to go in the future. We’re going to be locked into this location for a few more years, but for our next location, we’d like to purchase it ourselves. A bigger building, a dedicated parking lot, that sort of stuff. We don’t plan on moving around all over the place, we want to find a spot that’s perfect for us and we envision owning our next location. [In addition to all of that], building our presence at conventions; not just local conventions, but bigger ones like WonderCon in Anaheim, and maybe even San Francisco Comic-Con and Phoenix Comic Con, and so on. MV: Sounds like Invincible Comics has lots of long-term goals! Looking into 2019, what would you say are some things on your to-do list for this year? Beck: Well 2019 is going to be a big year for us in advertising. 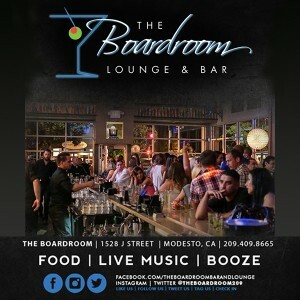 Even though we’ve been here for two years now, we still get people coming in and saying “We had no idea you were here!” And that’s to be expected, we’re the new kid in town and that’s fine, but I’d like for us to have a bigger presence and grow our visibility in Modesto and beyond. Invincible Comics is located at 1035 W. Orangeburg Ave, 95355, or you can find them online at Facebook.com/InvincibleComics. They can also be reached by phone at (209) 409-8027.